According to Deadline, Steven Spielberg and Leonardo DiCaprio are looking to reunite for the first time since 2002's Catch Me If You Can with a biopic about Mr. $50, Ulysses S. Grant. Spielberg reportedly wants to direct the film with DiCaprio starring, naturally, but it sounds like the big issue is finding a suitable opening in their busy schedules. Spielberg has to make Indiana Jones 5 for some reason, a new West Side Story movie, and a movie about classic DC Comics pilot team Blackhawk, and DiCaprio has to make Quentin Tarantino’s Charles Manson-adjacent drama Once Upon A Time In Hollywood, a Leonardo Da Vinci movie, and whatever other things he signs on to while Spielberg is making his many movies. 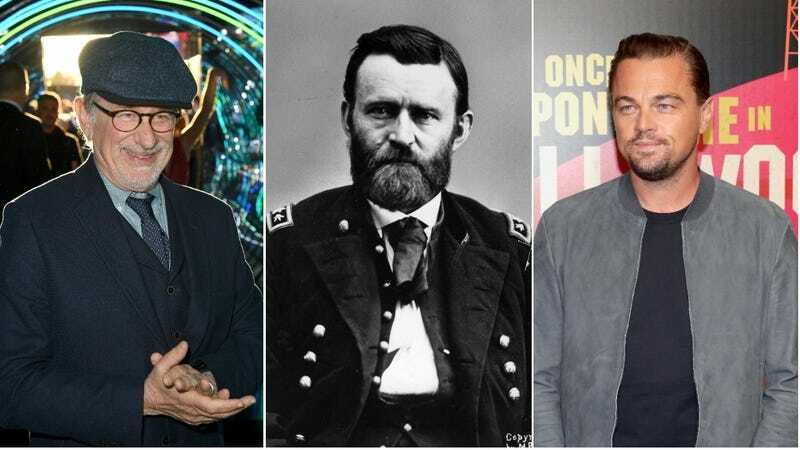 Still, they both reportedly want to make this Ulysses S. Grant movie happen, and Deadline notes that Lionsgate and DiCaprio’s Appian Way production company bought the rights to Ron Chernow’s book Grant a while back, so they also must be eager to do something with that book. Chernow, by the way, is the author of Alexander Hamilton, the book that inspired Lin-Manuel Miranda to write a certain musical. We’re not saying Spielberg’s Grant movie will be as much of a cultural event as Hamilton was, but “Based on a book written by the author of the book that inspired Hamilton” will look good on a poster.